VISSCHER - Belgium Foederatum emmendatè auctum et novissimè editum per Nicolaum Visscher. VISSCHER, N. - Belgium Foederatum emmendatè auctum et novissimè editum per Nicolaum Visscher. Belgium Foederatum emmendatè auctum et novissimè editum per Nicolaum Visscher. - VISSCHER, N.
Title : Belgium Foederatum emmendatè auctum et novissimè editum per Nicolaum Visscher.. Size : 18.5 x 22.0 inches. / 47.0 x 56.0 cm. Description :A well detailed map of the present day Netherlands. The most southern part of Limburg in an inset, lower right corner. Taken from the atlas Germania Inferior, sive XVII Provinciarum Geographicae generales ut et particulares tabulae. 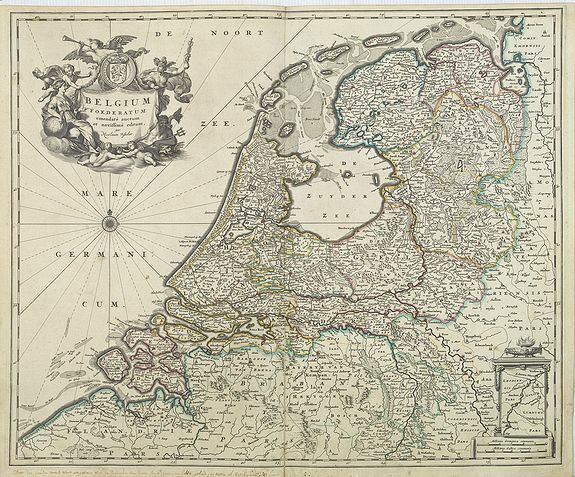 Kaert-Boeck van de XVII Nederlandtsche Provincien published by Nicolaes Visscher II which contained 21 maps of the Low Countries. Condition : Some very light marginal spotting. Some contemp. handwriting in Dutch in the lower margin. Else dark and good impression on thick paper. Repair of a split lower part centerfold 15cm. Into engraved area. Very good condition.